The American Farm School is an independent, nonprofit educational institution located in Thessaloniki, Greece. The School was founded in 1904 by American missionary John Henry House to serve the rural population of Greece and the Balkans. The current major educational divisions include the Secondary School, Perrotis College, the Primary School Program, the department of Adult Education & Research and the Greek Summer program. The School's mission is "to educate men and women, especially those from Greece and the Balkans, to become professionally accomplished in the latest aspects of agriculture and the life sciences. IRTC accepted the invitation of the AFS to interact with the students on topics of Hydroponics and Greenhouse Management. 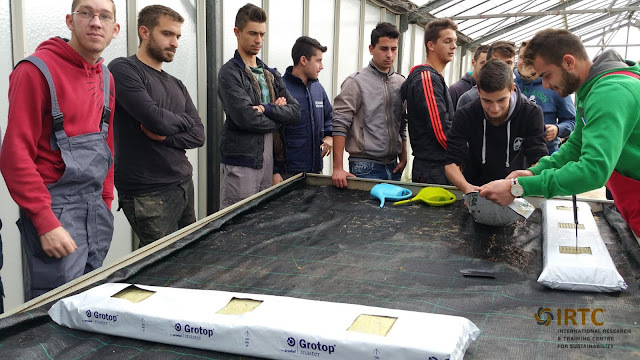 Mr. Christos D. Katsanos, Agronomist M.Sc., MBA shaded his knowledge and experiences with the young "farmers"!.